Today we met with Phil Harrison from BBC Radio Kent at the Penny Farthing on the Invicta Way, part of the Crab and Winkle Way. Phil rode with us to Canterbury to meet members of Spokes East Kent Cycle Campaign. 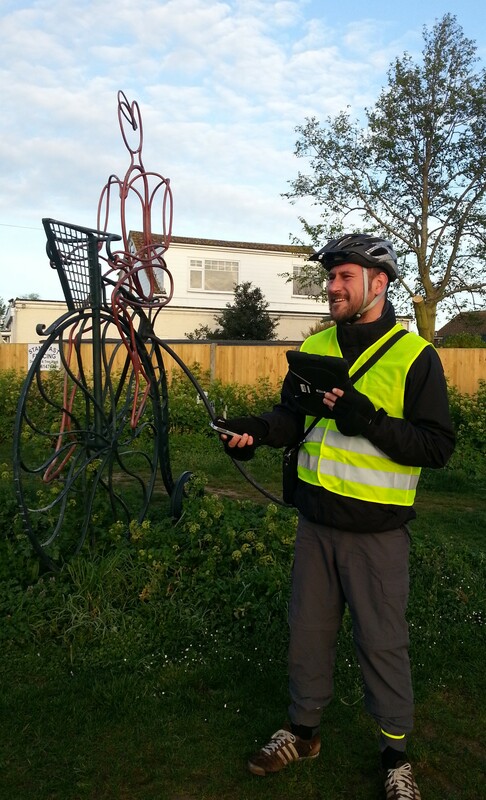 The reason for Phil’s visit was to find out why less people are commuting in Kent by bicycle according to a census from 2001 to 2011. Since 2011 we have had some infrastructure improvements and with the impact of the Olympic games hopefully that trend has reversed. As we cycled up the old track bed to the winding pond Phil asked, ‘Why don’t more people do this?’. It was a lovely sunny morning and as usual an absolute joy to commute along the Crab and Winkle. We met at about 6:45 but we still saw other cyclists and passed dog walkers who said hello as they always do. When we reached the University Phil went on to meet Adrian Oliver from Spokes and CyclingAge to talk about their Dr Bike Lab and issues cyclists face. Many thanks to Adrian, Phil, Radio Kent, CyclingAge and Spokes for making this happen. You can listen to the radio show for the next 7 days on the BBC iPlayer the main cycling features are at 1:53:00, 2:36:50 and 2:50:32.